Gas production can lead to fault slip in the subsurface, which can result in earthquakes. 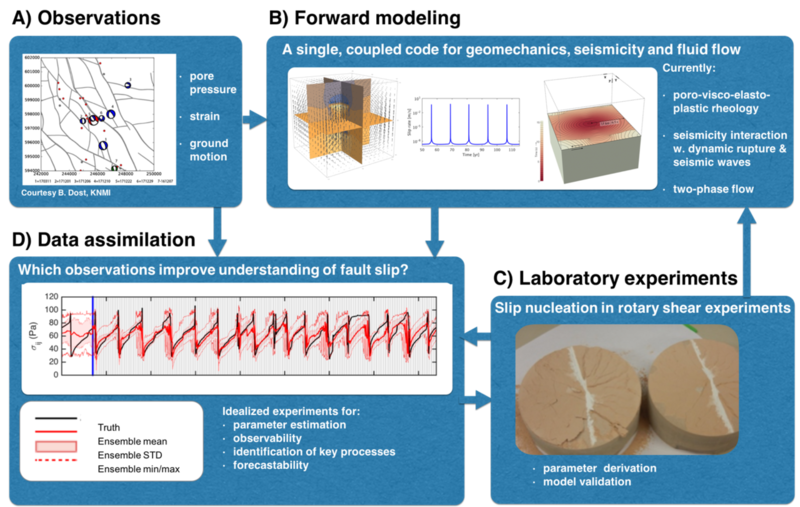 By combining measurements of fault slip in a laboratory with state-of-the-art multi-physics models through data assimilation, we can refine a faults properties and variables. This allows to better understand the physical processes at the fault’s interface. Successful synthetic tests have demonstrated the vast potential Bayesian data assimilation to estimate and forecast fault stress. We now aim to evaluate whether Bayesian data assimilation can reliably constrain and probabilistically forecast fault slip in laboratory experiments. This research could ultimately provide a decision-making tool that through considering different gas-production scenarios helps to minimize the effects of earthquakes for society. Gas production can induce seismicity through changes in normal and shear stress on pre-existing faults. Which processes govern these stresses is presently a subject of debate. Compaction, fluid flow and friction each play a role in the occurrence of seismicity. Only if we can resolve these three aspects, their interactions and the resulting stress field, it may be possible to estimate and ultimately forecast seismicity. This is not straightforward, as uncertainties in subsurface conditions, the inherent intermittent occurrence of fault slip, and the limited availability of insitu observations make it difficult to uniquely describe responsible mechanisms, let alone provide probabilistic estimates of seismicity. In InFocus, we do this through coupled simulation of geomechanics, dynamic earthquake rupture and two-phase flow with a code originally developed for large-scale tectonic settings. Analysis of seismic observations over the Zeerijp area of the Groningen field will help to calibrate the model so it can be used in reservoir-scale studies. Next, we propose to further refine the state or parameter estimate using a statistical, Bayesian approach in data assimilation. To test the validity of this data-assimilation approach we develop a simplified, controlled laboratory setup of a slipping fault monitored with acoustic emission sensors and strain sensors and a parallel numerical simulation of this setup in which we assimilate the lab measurements. This helps to identify what observations would be required to better understand and ultimately forecast seismicity as a result of gas extraction. Extending data-driven simulation tools developed for subduction zones to laboratory and reservoir scales is expected to shed light on the dynamics and occurrence of seismicity. The recent seismicity induced by natural gas extraction from the Dutch Groningen gas field underlines the importance of understanding and forecasting induced seismicity1,2. At the moment, quantitative estimates of key processes and their uncertainties are lacking. A predictive tool for decision-making requires integration of state-of-the-art experimental, numerical and observational analysis across a range of spatial scales. The integration of existing elements in InFocus will provide a framework to evaluate future and past decisions on gas extraction as, for example, the recent decision to halt gas production in Groningen3. In addition, it provides a first step towards a means to forecast induced seismicity. Insights are evolving through observational, laboratory and numerical studies. High-resolution observations of seismic activity in the Zeerijp area of the Groningen field have been used for estimation of epicentre location and source characteristics11. Laboratory experiments quantify controlling fault properties and allow to study fault-rupture processes in more detail. Modelling studies address the processes involved in fault rupture and their influence on the occurrence and severity of seismic events in a reservoir setting12-15,5 of both observations and laboratory experiments. Figure 1. 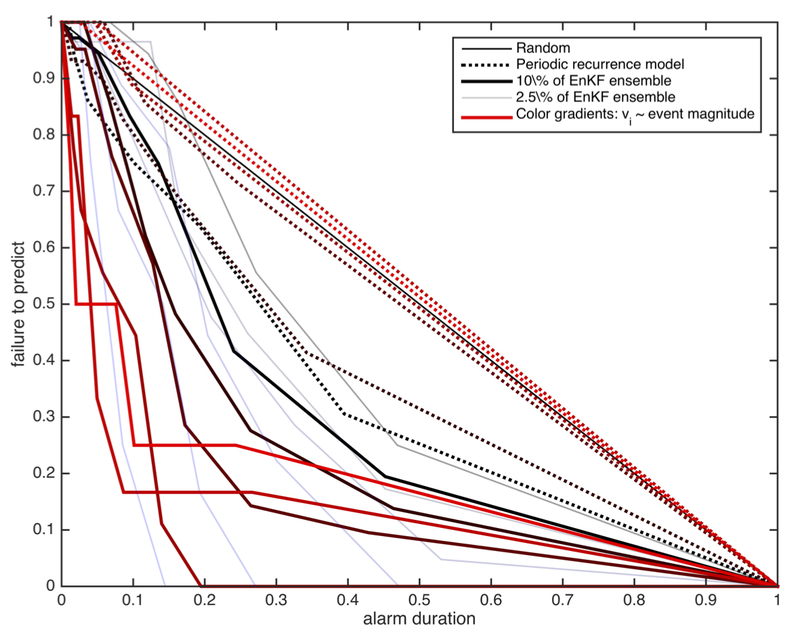 Error diagram illustrating exceptional performance in forecasting large synthetic earthquakes, since the red, solid lines approach the optimal origin (0,0), while the periodic benchmark (dashed red lines) rather performs random16. InFocus will complement geophysical observations by laboratory studies and numerical simulations. Key in this integrated approach is the use of data assimilation methodologies. Data assimilation methodologies originate from meteorology and oceanography. Bayesian data assimilation has been shown to be very effective in estimating and forecasting fault stress in a perfect model test of seismic cycle models in subduction zones 16 (Figure 1 and 2D). We now aim to evaluate this potential in a real-life laboratory setting in which physics is not represented perfectly. In addition to constraining model uncertainties, data assimilation can also help to identify which observations provide the most valuable information for estimation and forecasting through value-of-information studies17,18 . It provides a quantitative tool for decision making that provides key information to policymakers to define the requirements for present and future monitoring programs. Given the growing societal requirement for monitoring and forecasting the environmental effects of subsurface activities, these objectives will eventually provide key information to policymakers to prevent any undesired effects of subsurface activities. Figure 2 illustrates the various parts of the project and how they are interconnected. Eventually, this will lead to improved identification of physical mechanisms responsible for induced seismicity due to fluid extraction as well as an assessment of the relative influence of observations in the controlled laboratory setting, which will help to define observational requirements for realistic cases. Figure 2 Elements of InFocus and their connections. A) Seismological observations of the Zeerijp area. B) Examples from the available poro-visco-plasto-elastic model showing a 3D viscous sinker, seismic cycles, a 3D dynamic rupture. C) pistons for laboratory experiments in the Utrecht High Temperature Laboratory. D) proof of concept of data assimilation for shear stress estimation with the available model. The integrated approach of InFocus is founded on the involvement of staff of various fields of expertise, employed at six different knowledge institutions (Fig. 3). The involvement of staff from both Delft University of Technology and Utrecht University is critical for the success of this project and will form the central piece in the network of institutions involved. 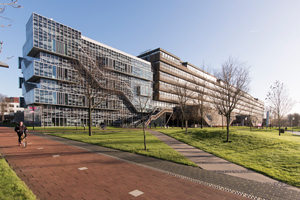 To reach the research objectives, three people will be recruited: one PhD student at Delft University of Technology, one PhD student at Utrecht University and a post-doc. Strong interaction between all researchers will be ensured through regular meetings in and personal visits to Utrecht, Delft or the KNMI. Yearly visits to collaborators in Sheffield, Reading and Zürich will stimulate the interaction with international leading experts at University of Sheffield, University of Reading and ETH Zürich. Collaborations with: Peter Jan van Leeuwen (University of Reading/Colorado State University), Taras Gerya (ETH Zürich), Caspar Pranger (ETH Zürich), René de Borst (University of Sheffield), Jan Dirk Jansen (Delft University of Technology) and Liviu Matenco (Utrecht University). Through regular visits of staff to the various knowledge institutions, the research team will be able to work in seamless collaboration, leading to inspired partnership in follow-up projects. 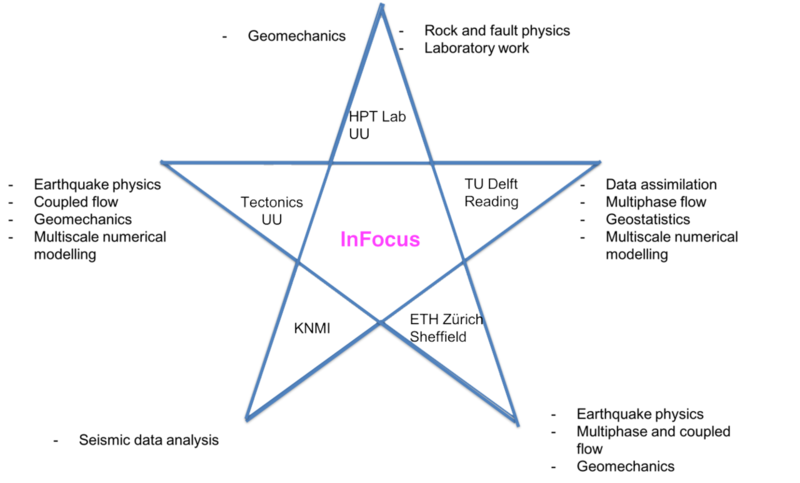 Figure 3 Embedding of InFocus within ongoing research of the institutes involved. Wees, J.D. van, P.A. Fokker, K. van Thienen-Visser, B.B.T. Wassing, S. Osinga, B. Orlic, S.A. Ghouri, L. Buijze, and M. Pluymaekers (2017), Geomechanical models for induced seismicity in the Netherlands: inferences from simplified analytical, finite element and rupture model approaches, Neth. J. of Geosci., doi:10.1017/njg.2017.38.